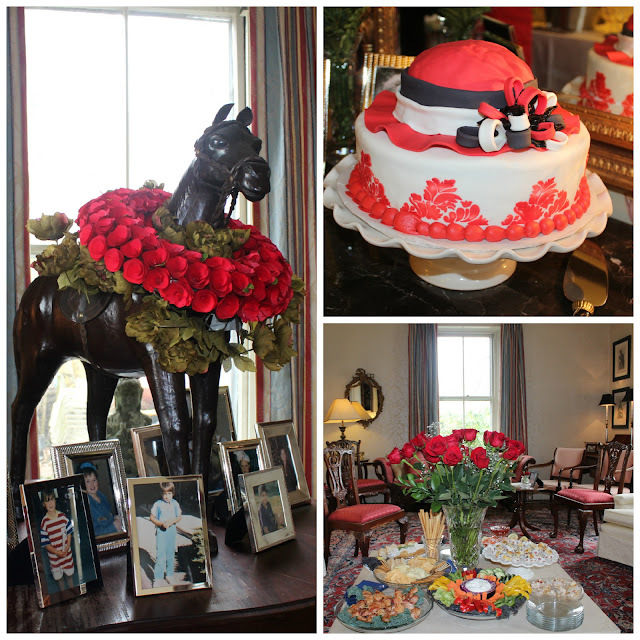 Bridal Shower : A Royal Derby Affair! unforgettable bridal shower to shower the soon to be newlyweds with gifts and to have a swanky party to go with it. With one person traveling abroad most of the time, one just becoming a new mom, one being a mother of two young girls with a full time job and myself, planning my own wedding, we thought the best way to plan the shower was via email, which worked out perfect! After countless emails going back and forth originating more than a year ago, I suggested doing a Kentucky Derby theme. The idea was well liked and the creative juices started flowing. I have to admit, this is one organized and creative group. We exchanged "pinterest" inspired ideas on a regular basis and there was so many great suggestions. The maid of honor, Melissa, was amazing at executing the plan. We all knew what we needed to do so there was no confusion or overlap. Melissa sent out the beautiful invitation a couple of weeks ago for our Kentucky Derby Soiree. Matching mother and daughter hats, how precious! The Setting: Alice's parent's beautifully adorned 1860' s Victorian home, it was absolutely perfect! ... is your mouth watering yet?? and I haven't even listed the desserts yet! The Drinks: You can't have a Derby party without mint juleps! We served mint juleps, Melissa's homemade delicious ice tea (I drank like 10 cups), pink lemonade and wine. The Entertainment: We hired a musical duo. One played the piano and the other one sang. The Decor: Red Roses galore! Melissa came up with the idea of pictures of Sam and Alice throughout the years. This was so much fun! Sage did a great job find pictures of Sam. They were strategically placed next to pictures of Alice with the same theme (ex:beach them, nerdy them, etc), horses and wreaths. The Favors: Potted mint leaves in clay planters. The guests loved them. We thought they could use them to make their own mint juleps or even just for garnish. I always use mint leaves in Asian cooking and summer is around the corner so they will come in handy for gin and tonics and salads. I scored two! Aren't they beautiful?? Mrs. Hubbell was very gracious to let us use her china, crystal and silverware. We were very careful with all of it as she told us the story of how she obtained the china when she got married. Everything matched and it was elegant and beautiful! The theme went well because the bride to be actually registered for Royal Crown Derby, Derby Panel Green as her china set, what a coincidence! Fun fact, The Royal Crown Derby Porcelain is one of the oldest English porcelain manufacturers based in Derby, England. The bride to be was beautiful and glowing! She wore a strapless dress and her mother custom made her a navy Derby hat. She rocked the pumps like a pro! The crowd was great, everyone mingled and enjoyed themselves. I was told some of the ladies were very excited about the hats and went all out putting one together. Some definitely made more effort than others but everyone looked fabulous. Mrs. Hubbell made the bride's hat using tulle, feathers and ribbons. I was very impressed! I was less creative and bought mine last minute at Kohls. It was pretty pathetic actually. Alice received many wonderful gifts and they were all beautifully wrapped and packaged. The bridesmaids and I discussed that this was one of the first bridal showers that we attended where there was not one typical black and white Crate and Barrel box. There were exquisite bows and packages with flowers on the gifts. Instead of doing the traditional ribbon bouquet, we did a "Ribbon Hat" where Maureen attached the ribbons and flowers to a hat that Alice would wear during the wedding rehearsal (and hopefully at her bachelorette party), we joked that the morning after we would go somewhere fancy in Boston for brunch sporting our Derby hats and pretend we were from out of town. The bridesmaids gave Alice a group gift, "Baskets of Firsts", a basket full of drinks to open during special occasions such as their first anniversary, first Christmas Eve, first pregnancy, etc. I tried to find a wine crate at Michael's and had no luck but I found a green basket with a lid and thought that would work. Sage suggested a bottle of water for "Wedding night" which was a great idea because they are probably going to be drunk and tired from all that dancing and celebrating! Maureen came up with the idea of note cards for guest to write notes to Sam and Alice for them to open up in the future during occasions. Guess which one mine was? Overall, I think the party was a great success and pure elegance! We received many compliments and it was one of the best parties that I've ever been part of. The bride was very grateful and the look on her face was worth it all! She deserved it and I was happy to be part of it! I couldn't have done it without the other girls and we worked great as a team! Great job ladies! Well done! We had so much fun! We managed to get everyone out for a quick group photo on the front steps of Mrs. Hubbell's lovely home.